I was under the impression wall base plates should be attached to basement concrete floors with lag bolts. The builder in my case pressed the baseplates into wet concrete instead of using anchors. There are many voids in the concrete under the baseplates and a perfect entry point for water. Did my builder violate code potentially. My house was built in 1989 and I'm in Shakopee MN. Thanks for any possible insight! That is a terrible concrete job at your basement, it looks as though this was the contractor’s first concrete job or he just did enough to get your money and move on to the next guy. Not only the concrete job was bad, so as the framing. It appears the bottom plate is not level - very unprofessional job was done at your basement. The photo is too vague to determine the purpose of the bottom plate mentioned. If the wall is non bearing, meaning it does not support any part of the building or house, the connection to the floor is less critical that’s why some walls are attached to the slab with just concrete nails rather than anchor bolts. From the photo it appears the bottom plate mentioned was added sometime later after the original construction. 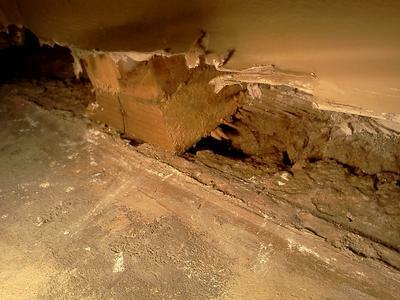 It also appears that the wood bottom plate is buried in concrete which is not allowed by code but if the wall is non-bearing the code, in some cases does not apply because a non-bearing wall at the basement does not affect the structure. The uneven concrete surface appears to had been a concrete wall that was taken out and add a framed stud wall. Whatever it was they did not do a good job.